NASA Pictures of the Universe | Galaxies, Nebluae, Stars and More! Spectacular NASA images of interesting scenes in the universe. A collection of images representing some of the most impressive views in our universe. Included are the Orion Nebula, a dying star, spiral galaxy, birth of a star, the Eagle Nebula, extrasolar planet, a galaxy pair and the Cartwheel Galaxy. Many of these are false-color images, enhanced to yield an artistic view. Spiral Galaxy: The magnificent M81 spiral galaxy takes center stage in this ultraviolet image from NASA's Galaxy Evolution Explorer. Young stars appear as wisps of bluish-white swirling around a central golden glow, which comes from a group of much older stars. 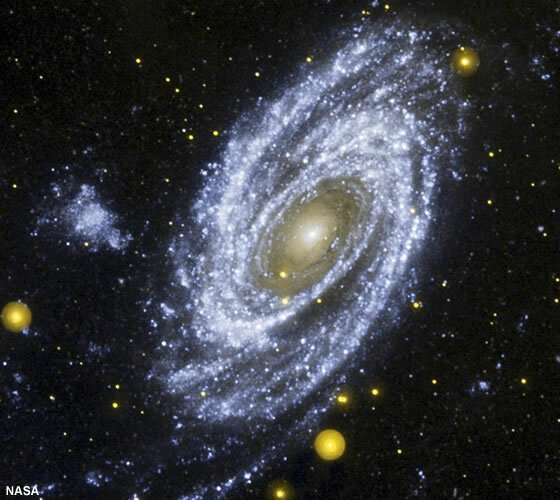 The large fluffy bluish-white material to the left of M81 is a neighboring galaxy called Homberg IX. This galaxy is practically invisible to the naked human eye. However, when viewed in ultraviolet light, a region that is actively forming young stars is revealed. Image and caption by NASA. Stellar Babies: Infant stars are glowing gloriously in this infrared image of the Serpens star-forming region, located approximately 848 light-years away in the Serpens constellation. The reddish-pink dots are baby stars deeply embedded in the cosmic cloud of gas and dust that collapsed to create the stars. Dusty disks of cosmic debris that may eventually form planets surround the infant stars. NASA's Spitzer Space Telescope took this image. Image and caption by NASA. 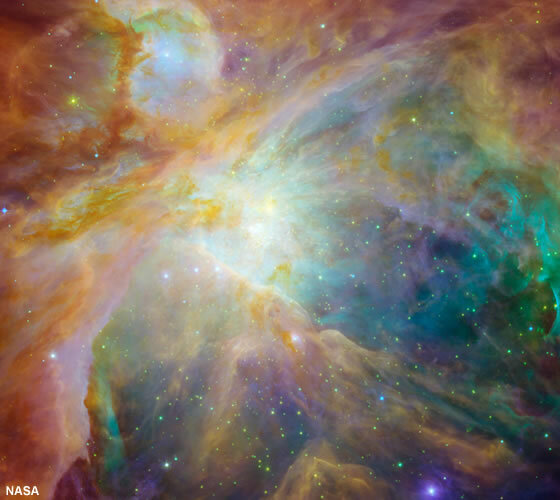 Chaos in Orion: Baby stars are creating chaos 1,500 light-years away in a cosmic cloud called the Orion nebula. Four massive stars make up the bright yellow area in the center of this false-color image from NASA's Spitzer and Hubble Space Telescopes. 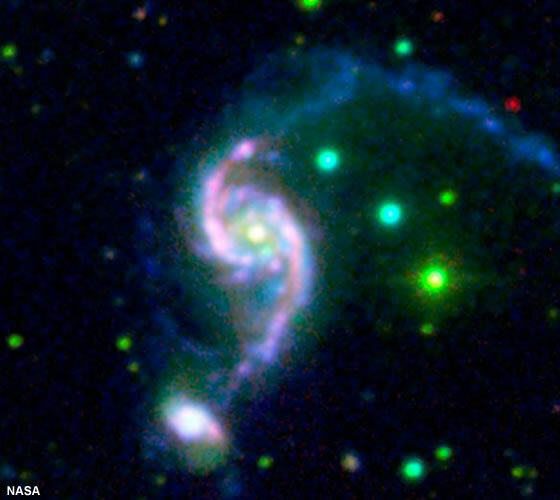 Green indicates hydrogen and sulfur gas in the nebula, which is a cocoon of gas and dust. Red and orange are carbon-rich molecules. Infant stars appear as orange-yellow dots embedded in the nebula. Image and caption by NASA. 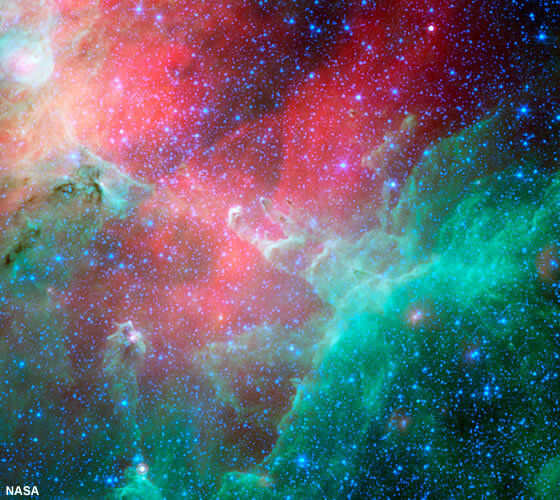 Eagle Nebula: A star-making region famous for its space pillars appears in this infrared view from Spitzer. 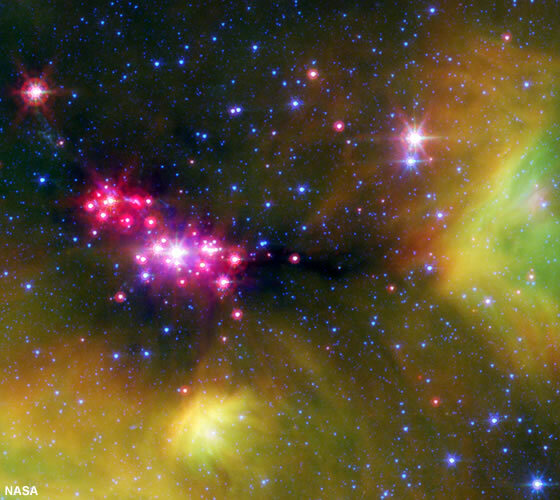 Green denotes cooler dust, including the pillars seen in the center. Red represents hotter dust thought to have been warmed by the explosion of a massive star about 8,000 to 9,000 years ago. Astronomers estimate that the explosion's blast wave would have spread outward and toppled the three pillars about 6,000 years ago. Since light from the Eagle nebula takes 7,000 years to reach us, this means we wouldn't witness the destruction for about 1,000 years. Image and caption by NASA. 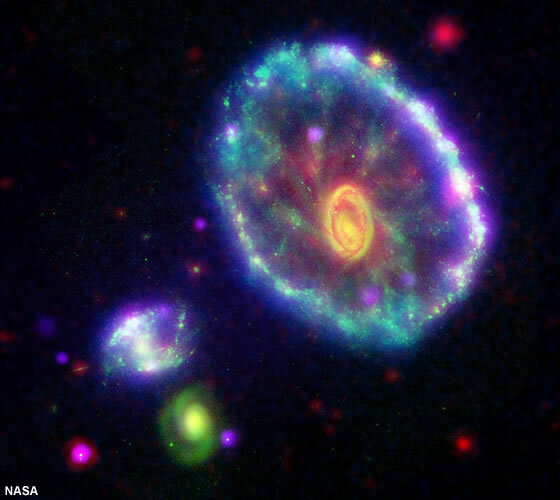 Cartwheel galaxy: A false-color view of the Cartwheel galaxy, created with data from Spitzer, Galaxy Evolution Explorer, Hubble and Chandra. Image and caption by NASA. The burned-out star, called a white dwarf, is the white dot in the center. Our sun will eventually burn out and shroud itself with stellar debris, but not for another 5 billion years. NASA's Hubble Space Telescope captured this view. Image and caption by NASA. Galactic Pair: An interacting pair of galaxies, together called Arp 82, is a scientific oddball. The color in the "tilted S" pair indicate that the observed stars are young to intermediate in age, around 2 million to 2 billion years old, much less the age of the universe (13.7 billion years). Scientists wonder why Arp 82 didn't form many stars earlier, like most galaxies of its mass. The Spitzer Space Telescope, the Galaxy Evolution Explorer and the Southeastern Assoc. for Research in Astronomy Observatory contributed to this image. Image and caption by NASA. Alien World: This is the first-ever map of the surface of a planet beyond our solar system. The map, which shows temperature variations across the cloudy tops of a gas giant called HD 189733b, is made up of infrared data take by Spitzer. 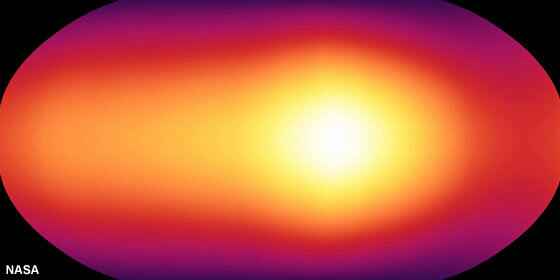 Hotter temperatures are represented in brighter colors. The map tells astronomers that temperatures on HD 189733b are fairly even all around. While the dark side is about 650 degrees Celsius (about 1,200 degrees Fahrenheit), the sunlit side is just a bit hotter at 930 degrees Celsius (1,700 degrees Fahrenheit). Image and caption by NASA. Kaleidoscope of Color: A giant jet of particles, shot out from the vicinity of a quasar, a type of supermassive black hole, takes center stage in this false-color image. 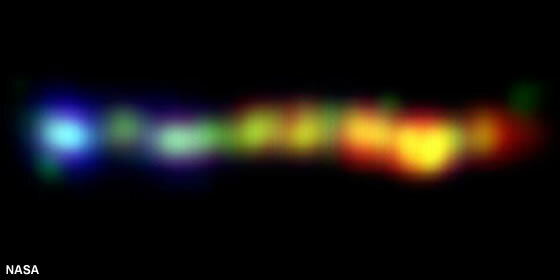 Quasars consist of supermassive black holes surrounded by turbulent material, which is being heated up as it is dragged toward the black hole. This hot material glows brilliantly, and some of it gets blown off into space in the form of powerful jets. 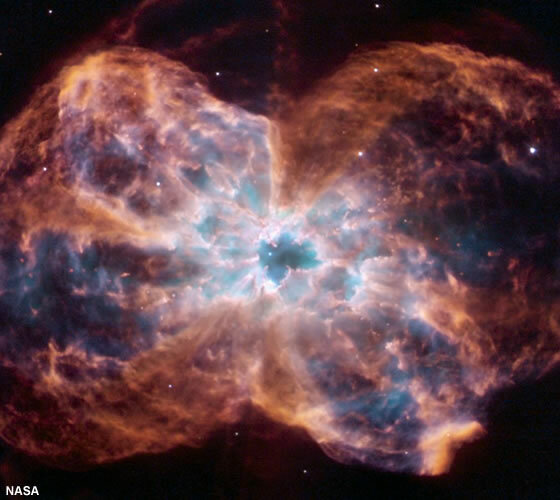 NASA's Hubble, Chandra and Spitzer Space Telescopes contributed to this image. Image and caption by NASA.